GenCyber Hawaiʻi is creating enrichment opportunities to train the youngest generation of cybersecurity professionals and teachers through its summer camps. Approximately 120 Hawaiʻi high school students and teachers participated in a week long GenCyber Hawaiʻi high school camp that started June 6 at Honolulu Community College. The week culminated at the University of Hawaiʻi at Mānoa with a Grand Challenge that incorporated coded clues that participants had to solve using cybersecurity concepts, tools and skills learned during the week. Gov. David Ige and Captain Cliff Bean with members of GenCyber Hawai’i. 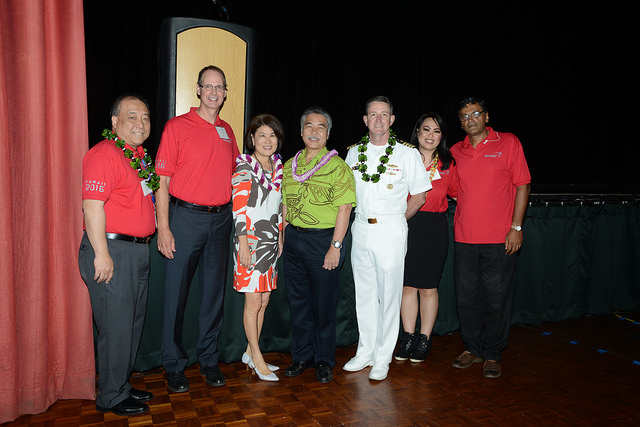 During the closing ceremony, students, teachers and parents heard from Governor David Ige, UH Vice President Garret Yoshimi and the Commander of National Security Agency Hawaiʻi Captain Cliff Bean on the strategic importance on cultivating cybersecurity professionals in Hawaiʻi. There was also a mini career fair set up for parents and students to learn more about career opportunities in the cybersecurity industry. In the second year of the program, students learned about ethics, cryptography, coding, networking and security. A total of four introductory and intermediate/advanced tracks were taught at Honolulu CC, with one track running concurrently at UH Maui College. The overarching goal of these camps are to educate high school students about academic and career pathways in cybersecurity, and to strengthen the cybersecurity knowledge base of Hawaiʻi high school teachers. In addition to the high school camps, teachers from kindergarten through the 8th grade level will participate in five additional tracks designed to integrate cybersecurity concepts into STEM curricula at various locations. Some of this year’s GenCyber camp participants. Sponsored by the National Security Agency and the National Science Foundation the goal of the camps is to educate young people about cybersecurity and encourage them to pursue academic and professional careers in this area. The Pacific Center for Advanced Technology Training and the Computing, Electronics and Networking Technologies program at Honolulu CC worked in partnership with the Hawaiʻi State Department of Education, the UHSystem Information Technology Services division, UH Mānoa Department of Information and Computer Science andUH Maui College to host these camps with financial and advisory support from the Public Schools of Hawaiʻi Foundation.